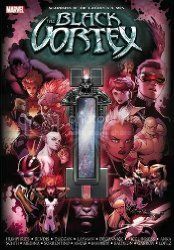 The X-Men (The All-New Teenage Team) and the Guardians of the Galaxy are in search of the Black Vortex, an ancient, cosmic artifact that seems to bestow unlimited power to those that gaze into and submit to it. With Mr. Knife's henchmen closing in on them, the X-Men and Guardians must decide whether they need to submit to the Vortex, and when they do, at what cost? This story really had a lot of promise, but somewhere along the line it seems to have lost its way. Events that should have had far more ramifications were more or less swept under the rug, and then the final few pages... After pining for Colossus for the better part of three decades, Kitty sure did fall for Star-Lord quickly. To be honest, even with the flaws aside, this whole story would have felt like it meant something if not for those last couple of pages; as a result, it just felt like the entire thing was written to set up Star-Lord proposing to Kitty. Lame.